Choo! Choo! A train themed boy’s 3rd birthday party is coming through! This amazing train birthday party was adorably conducted by party planning mom and graphic designer, Tali Burress, of A Party Studio. You will love the printable party decorations and embellished sweet treats on display, captured by All Things Great and Small. You may remember the helicopter party Tali threw for her son, Asher’s, 2nd birthday. While visiting his grandparents at Christmas he became fascinated with the train that they had moving around the Christmas tree, and a love of trains soon developed. Get more boy’s Choo Choo Train Party ideas here. As Tali explains, “It was clear that his party should be based around his new love of trains”. With a train museum nearby, Tali shares that it was the natural choice for the party venue. Little party guests had much to be excited about the dessert table! It featured a chocolate fudge two-tier cake in bright party colors, chocolate and vanilla cupcakes with train themed printable toppers, bright yellow rock candy and adorable custom wrapped candy bars. Popcorn was also served in festive party cones. I love the creative use of a handmade wooden train to display the candy. In addition to sweet treats, bagels, croissant sandwiches and fruit skewers were served. Darling train themed water bottles with custom beverage wraps were on hand for thirsty riders. Imagine eating in a train dining car! Each table had bowls full of pretzels, popcorn and more candy to ensure that no little engineers went hungry. Tali added colorful paper fans and streamers from Oooh La La Paperie, in addition to a printable Happy Birthday bunting to liven up the eating area. Party favors that match the theme are so fun! Each child received a train engineer cap, personalized train cookies made by Alaina Ladner and wooden train whistles. I can only imagine how much fun the children had riding the miniature train, wearing their caps and tooting their train whistles! 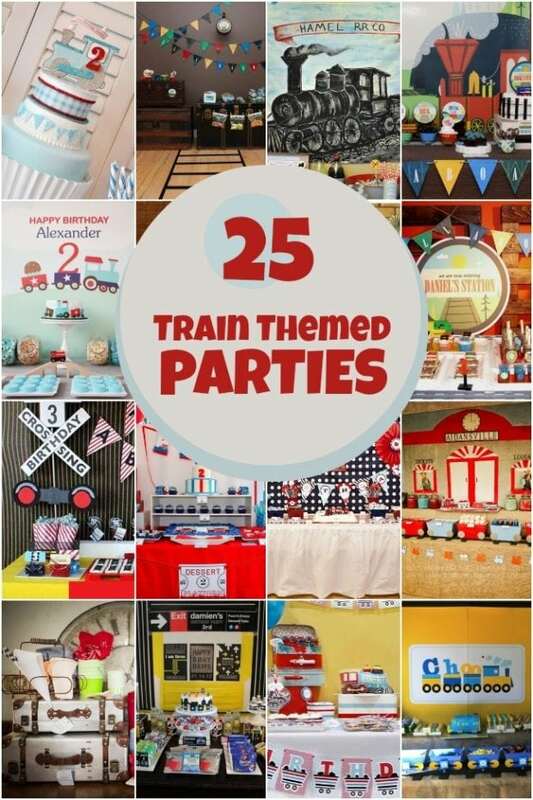 Be sure to check out more train themed boy birthday party ideas here.